After quite long hiatus from the last 6th series, masterpiece of otome game “Harukanaru Toki no Naka de” (or HaruToki in short) series that grabs the hearts of many girls is returning! As we know, this work released a lot of events such as live concert and seiyuu event previously. Harukanaru Toki no Naka de is a series of otome games developed by Ruby Party and published by KOEI, basically this is an otome game combine with role playing and board game. It is a part of the NeoRomance label, which also includes Angelique and La Corda d’Oro. Because of it’s success, the game has given rise to a franchise including several sequels, numerous drama and music CDs, manga series, two OAVs, movie, several seasons of TV anime series, and a lot of stage plays. Kojacon team was very happy to attend “Haruka Naru Toki no Naka de 3&6 ~ Haruka Bidanshi Matsuri Concert” in Chiba which held on June 3, 2017 at Ichikawa City Cutural Hall. We watched both session day live and night live! All audience who came to this event will represent “Miko”, female priest as shujinkou from HaruToki. 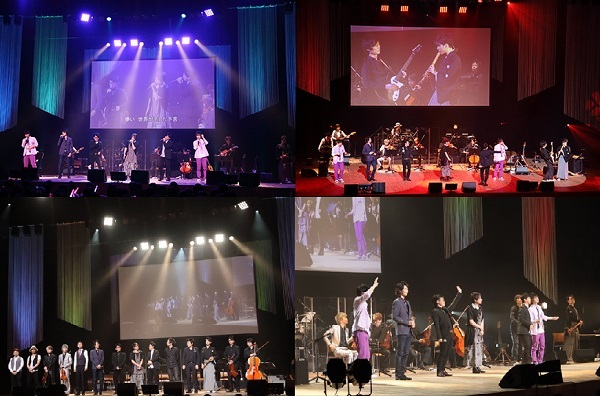 This time, beside three seiyuu from Guardians in Harutoki 3 and Harutoki 6, also came along to the event, Orchestra Band “YUKARI” who was formed in “Haruka Festival” two years ago. Contents are live orchestra, afureko (script reading), talk session, character song mini live, and of course lucky draw. So let’s move forward and welcome our guests today! For opening, YUKARI was playing the main music theme from both series, “Ruten” from Harutoki 3 and “Kurochou ~Kimi wa Mau~” from Harutoki 6. Combination between jazz taste, traditional Japanese sound, and string instruments drawn into overwhelming power within this live. Following the end of two BGM, Hinoe, Atsumori, and Kohaku showed up to stage and greeted all miko with welcome message from each game series. There’s similar afureko for day live and night live. First part of script reading is started with HaruToki 6 (plus sequel game version HaruToki 6 Gentou Rondo) when memories from Kohaku and Miko rewinded together with 8 Earth & Sky Guardians. Music themes played by YUKARI in this session are Egao no Makuake, Teikoku Gun, Kowaku no Mori, Hiru Sagari no Kouhii, and Arifureta Hibi. Several CGs from HaruToki 6 were simultaneously displaying on screen. 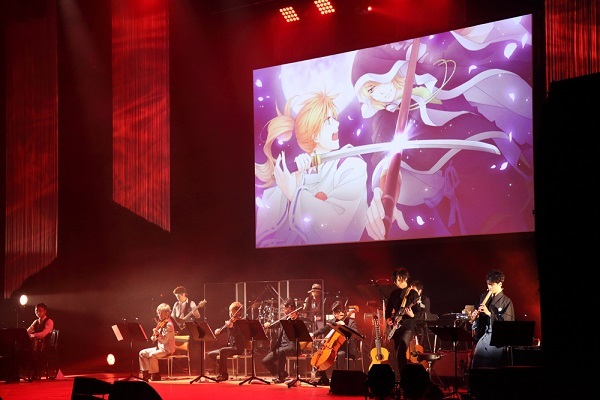 Continued with script reading from HaruToki 3 (plus remake game version Harutoki 3 Ultimate) by Hinoe and Atsumori, when they talked to Miko about thought of Gods and her Guardian with some CG displayed on screen. Some music themes from this series are Hidamari, Anun, Aoba, and Kakugo for the last scene. This part was closed with theme song corner which performed by Ryuu Hirabayashi from YUKARI. What a lively singing voice for ending theme of HaruToki 6 “Seasons~Harukanaru Sora” (originally performed by Infini). Following session is talk corner between three seiyuu and YUKARI member. At first, all of them said that they were very nervous performing in such live orchestra which never been done before. Then, Ryuu and Masaki came up to give short lecture about the instrument (shakuhachi), like how to play it properly and how long is the lenght between the small shakuhachi and large shakuhachi. Suddenly the “length scale” topic is moved out of context and ended by Hinoe and Atsumori said “let’s recalculate the length at changing room later!” while Kohaku just watching the quarrel seriously, LOL. This session is closed by big applause when each cast ask Masaki to play shakuhachi with one given clue. Great play for day live, Masaki! On the second, night live, Ryuu and Jun came up together with Kohaku, Hinoe, and Atsumori. Here, they got another lecture about accordion. So actually it’s harder and more complicated to play accordion then shakuhachi, there’s a lot of buttons to press lined up on both sides just like an old type-writer machine. Again, each cast ask Jun to play accordion with one given clue. While YUKARI member feel so embarrassed, audience and all cast seems very delighted with this talk corner. Finally! The long-waited character song mini live is here! 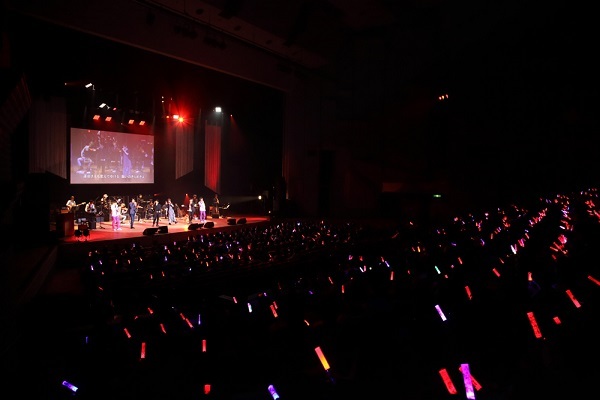 All audience took out various psyllium lightstick from several previous HaruToki events. After mini live, there’s some commercial info showed on screen. Such as release date for some vocal CD and drama CD, new character goods and merchandise, also DVD info from previous live event. Some of them are sold outside the venue, but some of the releases are still on pre-order session. When two MC returned to stage, they called up Hinoe, Atsumori, and Kohaku for helping them in lucky draw session. Today they will give away one signed poster, signed key holder of each character, and one signed pamphlet of today’s event. Twice, on day live and night live, so total will be 10 prizes. Unfortunately, Kojacon didn’t win any prize from both live, the seat number is very close to us but it wasn’t any of us, LOL. It’s almost the end of event, we returned to live orchestra from YUKARI that played battle theme this time. 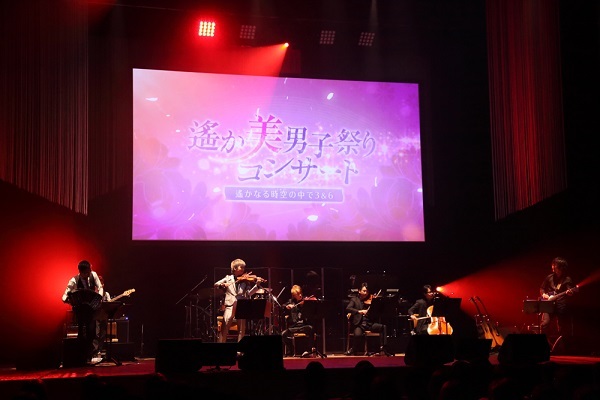 Following passionate battle theme, all cast came up to the stage one by one to deliver “ai kotoba” or love message from each CG of the game. Kohaku showed up first with his unrequited love to miko, it was very sweet moment for us. Next up is Hinoe that showed his forcible love to miko, which is very passionate. The last one is Atsumori who has the most serious face on the game, just talked about memories between his elder brother and miko. All audience who played these games already, suppose to play them again one more time after this event. For epilogue curtain call, all cast and YUKARI member came out to say farewell greetings. HaruToki is one title which is very close to music, not only a drawing with additional sound effects. It’s so different. Beautiful music on game, nice music on anime, and also very adorable music in each live. Just listen to the music and I feel so excited instantly, but I feel more excited every time I sing it. I want to do this again with you all in near future! Thanks a lot for coming today, see you soon! I love orchestra very much, that’s why I was very nervous and yet very happy that I could join today’s live. You must be enjoying the live right, but actually I’m so nervous here LOL. Anyway, music from live orchestra is so lovely, isn’t it? Both BGM and each instruments are so amazing! Please support HaruToki until the end! Thanks a lot for today, this was really fun! I’m very touched with all YUKARI member and how they played the instruments just today, it’s like keep echoing in my heart LOL. Honestly speaking it reminds me about the scene of Hinoe and Miko together, I’m so moved. I feel like spent extravagance time today with you all, I’m so happy about it. Thank you for coming today and thanks for supporting HaruToki. We will meet again soon in the next event, right! See you around, Miko! Hope you will meet your desired Guardian soon!